Whether you need to protect your vehicle from harsh weather, or your warehouse is home to delicate items needing protection from the harsh conditions outside, steel-stiffened doors are an excellent way to protect property without giving up aesthetic appeal. 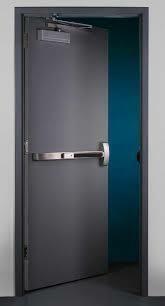 A typical steel-stiffened door is made of hollow metal that includes steel channels through the full height of it. These channels, which are spaced about every six inches across the width are spot-welded to the door and then filled with insulation between the steel. In addition to being useful in areas where severe weather is a concern, steel-stiffened doors also protect against high sound transmission ratings. One reason steel-stiffened doors are popular is that they are versatile and customizable in design. They can be constructed for oversize spaces and feature 22-gauge cores with skin options that range from the standard-duty 18-gauge to the extra heavy-duty 12-gauge. Other features include a range of materials, two types of edges and edgeless, seamless options. Finally, steel-stiffened doors can be made with a range of reinforcements, including cylindrical locks, surface closers, pull plates, pivots, and 7-gauge hinges. Energy prices are on the rise all the time, but steel stiffened doors have plenty of eco-friendly benefits that cut costs and protect the planet in the process. Many of these strength-focused doors are rated up to +/- 100 psf for hurricanes and they have some of the lowest U-Factors in the industry. In addition to being eco-friendly, these types of doors can be made without weld marks so that they look aesthetically pleasing, even when using glossy paint. A range of color and design options are available as well. If you are looking to purchase steel-stiffened doors for your project, ensure you research the company thoroughly first. Compare construction options, styles, affordability, and more to find the right doors for your needs. Don’t forget to ensure the company has good reviews and a strong reputation with local business authorities.